There are very few authors who can make me want to write fan fiction—I just prefer to think up my own characters—but Laura Antoniou is one of them. 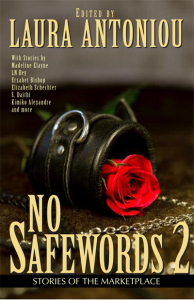 I am honored and pleased as punch to announce that my story “Rain Dog” is included in the new fanfic anthology No Safewords II, edited by Ms. Antoniou. Who but Sharon? Smokin’ hot, physically perfect and sexually hungry, yet a severe discipline problem in a world where discipline is all. So unruly. So in need of punishment. I think Ms. Antoniou’s greatest contribution to humanity may well be Sharon’s big scene from Chapter 18 of the first Marketplace novel; I believe it may have permanently altered my brain chemistry. One sad note, for those who follow the link to the print version: you may notice that this book is published by Riverdale Avenue Books, a fine company, but it means that it is not published by Circlet Press, where the Marketplace novels have been for many years now. Yes, Circlet Press will be closing its doors, another casualty of the post-50 Shades, self-publishing revolution—which I myself am a part of. They will be missed. But those of us who love Laura Antoniou’s Marketplace will follow her anywhere, won’t we? The ebook/Kindle version of No Safewords II can be purchased here, at Amazon. The book can be purchased in print here, from Riverdale Avenue Books.